One of the big TV-side reveals at the just-concluded San Diego Comic-Con turned out to be an extended tease of Adult Swim's new parody series, Mike Tyson Mysteries, a send-up of 70s and 80s celebrity cartoon series with the onetime Iron Mike providing his own voice. Goofy stuff, to be sure, and well in line with Adult Swim's current reigning original-programming aesthetic of protracted absurdist meta-jokes that feel deliberately designed to provoke pages of furious message-board rants about all the supposedly-glorious anime offerings they "should be" showing instead. But it's also something of a return to the programming blocks turn-of-the-millennium original formula, namely in the repurposing of nostalgiac animation characters and styles for ironic effect. In many ways, everything AS puts out that isn't a re-run of a Fox Network series -- even their offbeat live-action offerings (soon to include Aaron McGruder's incendiary Black Jesus) -- has descended in an unbroken lineage from Cartoon Network's original late-night curiousity Space Ghost Coast-to-Coast. 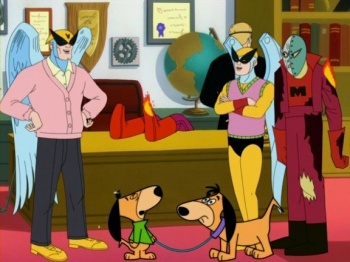 But none fit this formula more so than my favorite of the early AS offerings: Harvey Birdman: Attorney at Law. Birdman was a not terribly well-remembered (or well-regarded) Hanna-Barberra cartoon superhero of the mid-60s, originally packaged alongside a somewhat transparent Fantastic Four knock-off called The Galaxy Trio. He has a pet bird, a sometimes sidekick named Birdboy, takes orders from an eyepatch-wearing boss named Falcon 7 and loses his powers due to lack of access to the sun (he's solar-powered) about once an episode to generate tension. Attorney, like a lot of AS series to date, looks and sounds like a one-joke premise: Harvey Birdman (apparently his full name) takes up a law practice. Ha. The big gimmick (at least at first)? He represents cartoon characters accused of various crimes, sometimes satirical (Shaggy and Scooby-Doo get busted for possession, Droopy Dog sues a plastic surgeon for malpractice) other times just bizarre (Yogi Bear's young sidekick may or may not be the domestic terrorist "The Una-Booboo"). For most of the first season, the show was chaotically structured like a hellzappopin' sketch series, but swerved into a semblance of continuity and character-building for a two-part season finale that would define the remainder of the series (though individual episodes were still structured around cases for the most part). Falcon 7 was back on-hand, reworked as certifiably insane law firm boss Phil Ken Sebben (Stephen Colbert), along with the suspiciously calm "Peanut" (aka Birdboy) as a paralegal, and Hanna-Barberra obscurity Peter Potamus as... well, it was kind of unclear what exactly his job was, other than to discreetly ask various co-workers if they'd "got that... thing I sent ya?" Paget Brewster turned up as Phil's daughter in Season 3, also known as Birdgirl -- whom Sebben finds awkwardly attractive.